The Episode starts with Harman aiming gun at Sukha and leaving from the Police station. Harak Singh and Preeto reached there just then and ask him to go carefully. Sukha says my work is done, your son has become criminal and your bahu stole the baby. He says Soham will be sent to the right place. Harak Singh tells that their house can’t be destroyed who has a courageous son. Varun stops his car and makes Lawyer sit. Soumya shows Varun’s pic to the people on road and asks if they saw the man who took the baby. Sukha asks Inspector to leave his son as the criminal eloped. Harak Singh tells that Gurmeet is equally guilty. Inspector says they have to leave him. Sukha tells Inspector that Sweety is crying a lot. Sweety acts. Harak Singh says it is crocodile tears. Soumya cries for Soham. Saya asks her not to worry. Harman calls Soumya. She tells him everything. He asks where is she? Soumya says I don’t know, I couldn’t find him. Saya takes the call and says they are standing on the bus stand. Harman says I will come there. Sukha, Gurmeet, Sunaina and Sweety come there. Sukha asks everyone to be at home and asks them to act to be crying. He asks Sunaina to make tea. Gurmeet says Harak Singh will not keep quiet. Sukha says he has attacked on his spine and he has to helplessly rest. He goes to room and sees Harak Singh sitting there. Preeto locks the door. Raavi comes to hall and asks Gurmeet, Sunaina and Sweety to give their mobiles. She tell that Harak Singh can do anything with Sukha who is locked inside and asks them to give their mobiles. Gurmeet runs towards his room. Harman comes to Soumya and tells that Gurmeet fought with him intentionally, it was their trick. Soumya says she wants Soham. Harman asks her not to worry. Harak Singh tells Sukha that they didn’t come to kill him and asks where is Varun? Sukha says he got the child and left. Harman calls Harak Singh and asks him to enquire where did Varun take Soham from here being a tiger. Harak Singh assures him. He asks Sukha. Sukha refuses to tell. Harak Singh ties his hand and keep cloth in his mouth and take him towards the window. Raavi takes their phones. Harman says you will know in 15 mins. Harak Singh and Preeto take Sukha out of window and question Sukha. Sukha says Soham is not in your destiny. Harak Singh says I wouldn’t have talked to you if you were not her brother. Preeto asks Sukha to tell. Harak Singh asks Preeto to blind fold him and says lets decide if Soham is in our lives or not. Preeto blindfolds him. Harak Singh shoots near Sukha. Sukha gets scared and says I will call. Varun gets milk from a tea seller on the road. Sukha calls Varun and asks where is he? Varun tells that they are going to Chandigarh and he will update him often. Harman tells Soumya that they shall go. Raavi says she will trace the number. Varun and Lawyer reach the guest house. Varun asks him to order food. He says he will sleep. Harman and Soumya also reach there. He asks the reception guy, but he refuses to say. Harman bribes him. He tells that the man with the baby must be in room no 14. Soumya and Varun go to that room, but can’t find anyone. Soumya says Soham is not here. 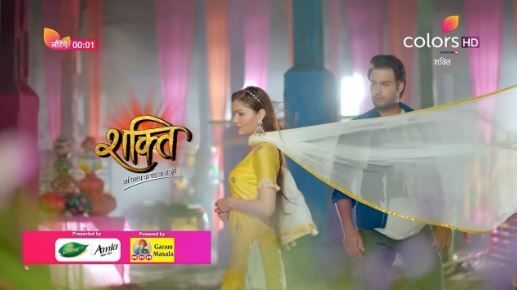 Harman calls Raavi. Raavi says last location is that only. Soumya says where to search him. Varun and Lawyer are in the car. They recall Lawyer sensing that the phone is traced and leave with Varun. Harman says there was nobody in the room. Receptionist says I don’t know, they left sometime back. Harak Singh calls Harman. Harman says they left from here 30 mins back and gets upset. Inspector stops Harman and says you eloped from lock up and your wife is a thief. Harman tries to tell him, but in vain. He runs. Inspector shoots at him twice. Harman gets badly injured and faints. Soumya is shocked.